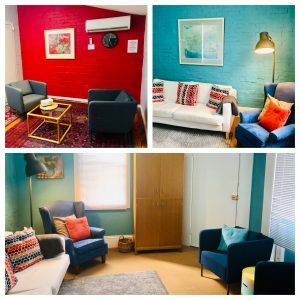 The NSWIPP house is a very pleasant training and meeting venue, with a leafy courtyard garden in a quiet part of Glebe close to Glebe Point Road. 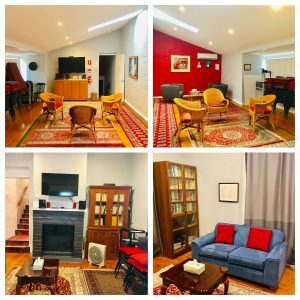 The two-storied venue offers a Seminar Room, a Reading Room (small meeting room) and a Garden Room with well equipped kitchen, couches, and a table and chairs. On the second floor, our seminar room has seating for 25-30 people in a lecture style format or is suitable for small group seminars of up to 20 people seated in the round. There is a whiteboard, an overhead projector and a TV and video/DVD player available for use. The room has air-conditioning for heating and cooling. The bathroom is next door to the Seminar Room. Upstairs mid-level is a small meeting room with couches, table and chairs. There is a computer and large screen. This room can be used for meetings for 6–8 people or as a break room from the Seminar Rm. The premises has two consulting rooms. Currently, there is availability on Mondays & Thursdays, but if you are interested in other days, please let us know so we can contact you if/when your preferred day(s) become available. 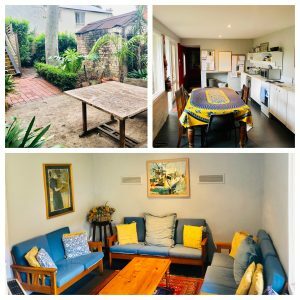 There is an outdoor garden courtyard area with a table and bench seating, a dining room with large table for up to 8 people, a kitchen with fridge, electric stove, microwave and dishwasher and sitting room with couches for up to 8 people. Wheelchair access is limited as there are stairs throughout the venue. NOTE: GST is included in these rates. There is 4hr metered parking outside the venue and non-metered parking a couple of streets away.